Gears Magazine | Where Did The Front Pump Go on Ford's New 10R80 10-Speed Trans? Where Did The Front Pump Go on Ford’s New 10R80 10-Speed Trans? For many years, the front pump in all automatic transmissions has been in the front behind the front seal, which the engine drives via the torque converter. But why call it the front pump and not just the pump? That’s because, back in the ’50s, many transmissions had pumps in the back of the transmission, driven by the output shaft. That put the “rear” in rear pumps. Now if we have a rear pump, then naturally we must have a front pump because, well, it’s in the front of the transmission. The first vane/rotor pumps were also introduced back in the ’50s in the RotoHydramatic. 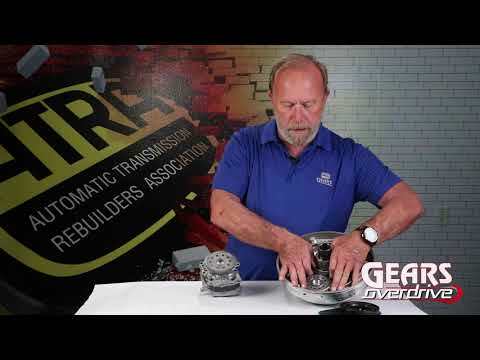 In this edition of Fun with Transmissions, we’re going to check out the new 10R80 transmission and specifically the pump and how it’s driven. The Ford 10R80 is a new 10-speed, rear wheel drive transmission that’s available in several models, beginning in 2017. This transmission is the result of a collaborative effort with General Motors. The GM transmission is the 10L80, which is available in several models as well. The 10R80 doesn’t have a traditional “front” pump. It uses a gear driven, displacement vane rotor pump. The torque converter drives the gears in the front support (figure 1). The front support bolts to the case and the pump sits in the case next to the valve body assembly (figure 2). With the pump removed from the case, you can see the idler gear that drives the pump gear (figure 3). With the drive gear on the pump driven gear, you can see that they both have the same tooth count. This means that, anytime the engine is running, the pump drive gear will be spinning at the same speed as the driven gear (figure 4). WHY USE GEARS INSTEAD OF A CHAIN? According to Ford engineers, the gear drive is a quieter arrangement than the chain-and-sprocket setup. They also say that the ball bearing on the idler gear is a longer-lasting, quieter bearing than a roller-type bearing (figure 5). Ford is building the 10R80 in very large quantities, so there’s little doubt that they’ll be showing up in your shop sooner or later. Stay tuned for many future articles as we discover the workings of this new 10-speed transmission. Meanwhile, make plans to see Robert Bateman’s informative presentation at Expo this year on Thursday at 2pm. He’ll be examining the 10R80 and the 10L90 and discussing how they compare. Until next time, keep having fun with transmissions, and we’ll see you in Las Vegas!